I'm not sure what type of blooming tree this is. It is in a tiny Texas panhandle town. At first, I thought it was a crabapple, but there are no leaves showing, so it must be something else. 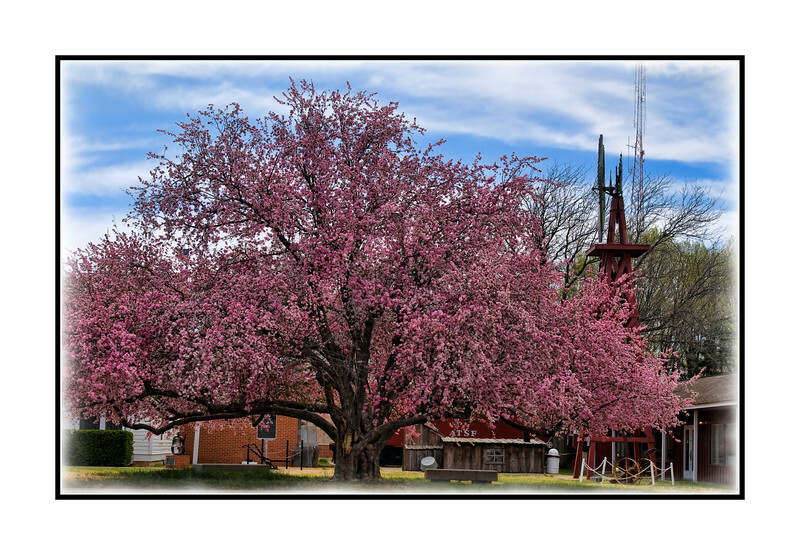 It is a gorgeous old tree and was totally covered in blooms when I photographed it at the end of March. Hope everyone had a good weekend and a nice Mother's Day! Super shot! Great capture of the blooms. Wow - beautiful tree and great capture of it! Outstanding! (literally!!) And love your treatment here. GREAT image for the 'Tree' challenge! Wow, what a tree! Wonderful shot to show it off. Great color. The shot captures the old: tree, wind mill, and grave in the back yard as well as the new radio tower in the back ground. Nice shot.